One of the perks of spending time at home in Atlanta is being able to cook a ton of stuff and not have to worry about lugging groceries across campus, sharing a kitchen with four other people, or having roommates eat all the food you slaved away making. My roommates are generally very respectful regarding my culinary experiments, but they do love my baking. When I'm at home, I can make a batch of these black and white cookies without hiding them in my room afterwards, though I do have to worry about my sister stabbing me with a fork if the cookies are good enough (yes, this has happened before). 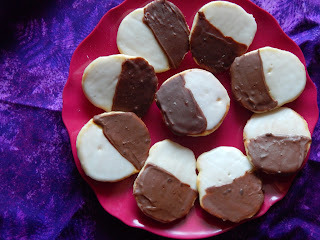 Black and white cookies are unique to New York (say that five times fast), so I don't blame you if you've never had one. Even if you do live in New York, good black and white cookies can be hard to come by; my grandma has been on a quest for the perfect cookie for years now. I'm not saying this recipe is as good as New York's best, but it's as good as it can possibly get outside the city. 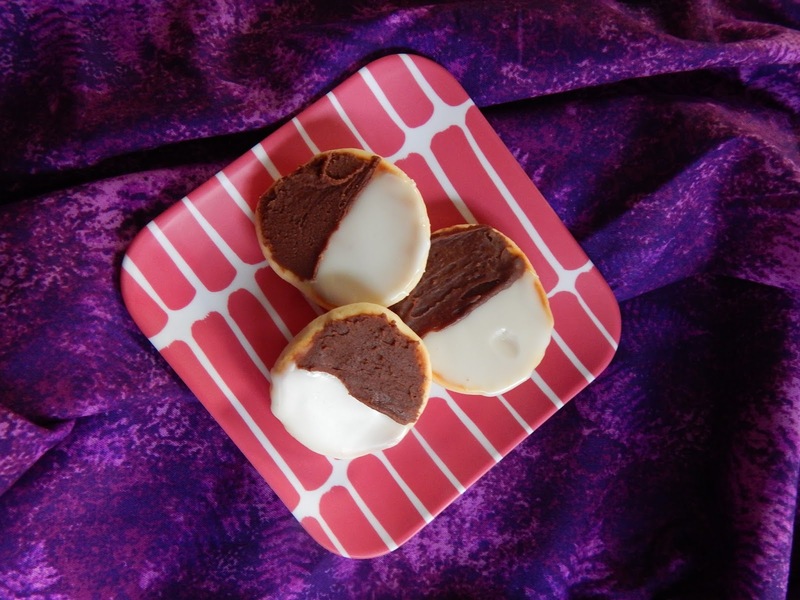 Black and white cookies are more cake than cookie, so think whoopie pies and you're on the right track. They're essentially mini vanilla cakes, but the best black and white cookies have an additional flavor that's pretty hard to place. It's kind of lemony but not really, and it's definitely not just vanilla. I've figured out that the best replica is butter flavoring, which you can buy from specialty baking stores or online. It adds an extra richness that you just don't get with plain vanilla, but if you love vanilla as much as I do and don't feel like buying liquid fake butter just double up on the vanilla extract. I'm still trying to figure out ways to use up my giant bottle of butter flavoring, so if you think of any recipes besides poundcake or waffles comment below. You get the cakey texture by making a very thick cake batter instead of a cookie dough. The main difference is alternating the dry ingredients with extra liquid ingredients instead of adding all the dry ingredients at once. Of course, it starts by beating the butter and sugar together then adding the eggs and flavoring; the flour mixture is then added with buttermilk in between. I always use buttermilk since the acid helps with the leavening and it just tastes better (my parents are sick of buying giant containers of buttermilk for small amounts like this disagree, but they don't have the little half-pints like I do in Wisconsin). 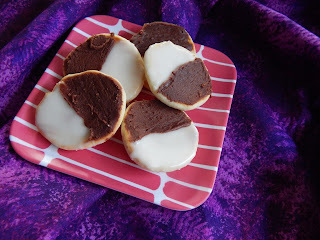 While vanilla cake cookie things are tasty, what makes black and white cookies special is the black and white glaze. It's a swipe of vanilla icing plus a swipe of chocolate icing that adds extra flavor and richness for cookies you can't stop eating. To make things easier, I make the vanilla glaze first, frost all the cookies, then add chocolate to the rest and frost the cookies again. 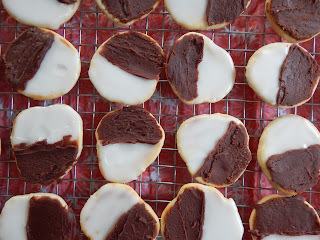 This results in cleaner lines (chocolate on top of vanilla doesn't mingle like vanilla on top of chocolate) and much less work than making them separately. The vanilla glaze is powdered sugar, water, and vanilla. You could use milk or cream for a more opaque icing, but then you have to refrigerate it, and lets be honest you're just after the sweet vanilla flavor anyway, not the creamy richness from milk. That's the job of the chocolate frosting. After you've used up about half your icing on the cookies, add some melted chocolate and corn syrup and voila you've got chocolate icing. You'll have to work quickly to frost the cookies before the icing firms up, but you can always microwave it for a few seconds to melt the chocolate again. 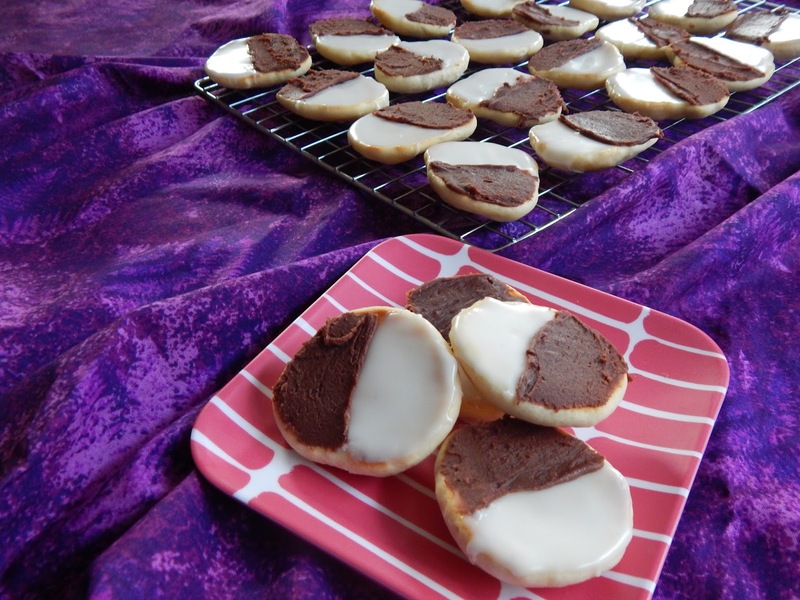 If black and white cookies aren't really your thing, you can go for an all-white or all-black cookie (no political statements here only extra frosting). You can also go naked or add other flavors to the batter, like orange zest. If you're really, really into chocolate, you can even add cocoa powder to the batter for a chocolate black and white cookie. This is brilliant work right here, people. The possibilities are endless and will surely satisfy your sweet tooth (and hopefully not those of the cookie-stealing freeloaders formerly known as your friends and family). Whisk the flour, cornstarch, baking powder, baking soda, and salt together. Beat the butter and sugar together until fluffy. Add the eggs one at a time, then add 1/2 tsp vanilla and the butter flavor. Add the flour mixture in three additions, alternating with the buttermilk in two additions. Scoop the batter onto the prepared trays and bake for 14 minutes or until the edges just begin to brown. When the cookies have cooled, whisk the powdered sugar and 2 T hot water together. Stir in the remaining vanilla and continue to add hot water until it forms a thick but spreadable glaze. Spread half the glaze onto half of each cookie. Melt the chocolate in a double boiler. Add the remaining vanilla glaze and corn syrup and whisk until smooth. 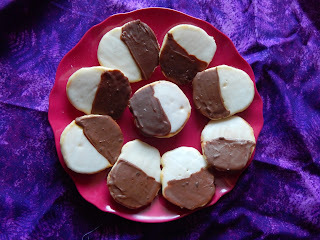 Spread onto the other half of each cookie.